If you have requirements that go beyond what is routinely offered as part of technical support, or you’d like to extend the capabilities of CatDV, you might be interested in our Professional Services offerings. 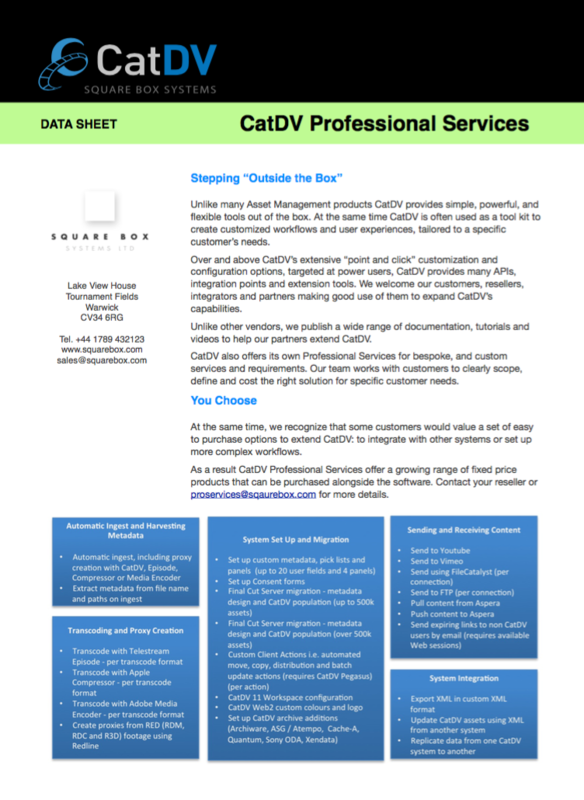 CatDV Professional Services can build new CatDV components and features, as well as help with custom deployment and configuration. CatDV provides a rich and powerful set of media management tools and has been designed to be as open and extensible as possible. We also provide detailed guidance and sample workflows in our Tutorials section of the web site. At the same time, we recognise that not everyone has the time or skills in house to perform integrations themselves. Square Box Professional Services can therefore provide a high quality, custom solution, tailored to your precise needs , with all the advantages of a fully bespoke solution but for a fraction of the cost. For more information please contact sales@squarebox.com. For more complex requirements, professional Services puts you in touch with our senior software developers and consultants who will work with you to solve any particular workflow problems you have and help you get the most out of the CatDV product family. To learn more or get a quote for a particular service please contact sales@squarebox.com. Please note all professional services work falls under our terms of business contract which can be viewed here.